Click here to register via MindBody. 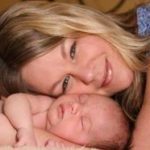 This past December I took the training to learn how to teach a new childbirth class developed by Rebecca Dekker PhD, RN, APRN, founder of EvidenceBasedBirth.com. As you may know, I have been an Evidence Based Birth®️ Instructor for several years now and have incorporated EBB learning modules into my classes in some form or another. This new class is different from what I have been teaching in that it is completely designed by Evidence Based Birth®️. An Evidence Based Birth®️ Instructor demonstrates comfort measures for the birth partner. 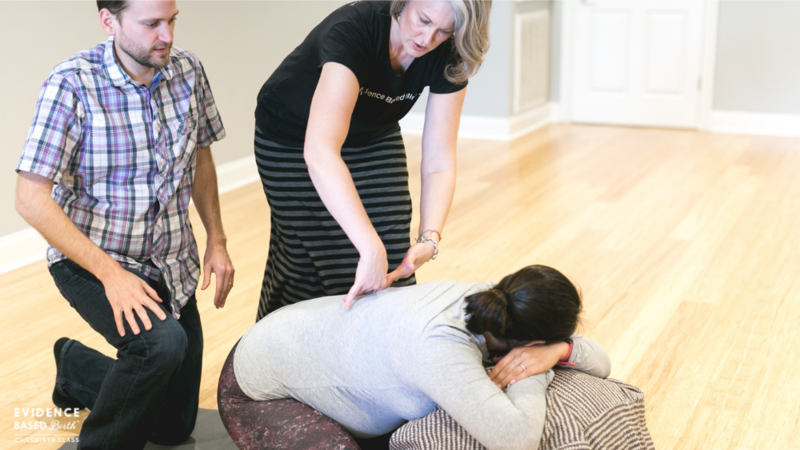 Two In-person classes for rehearsal of comfort measures and birthing time. This is something that is lacking from online-only courses. There is nothing that can replace having hands-on instruction from an experienced birth professional. Four zoom meetings. This hybrid format means that students are not coming to in-person classes for six weeks in a row and can enjoy four classes from the comfort of their living room in their fuzzy pajamas or from somewhere else like work or out of town (or work out-of-town!). A flipped classroom style of learning. Students learn content online and then participate in guided discussions during class time while getting their questions answered. PRIZES! Who doesn’t love getting prizes? Incentive is a driving factor for lots of people to accomplish their goals. Prizes make it fun for the birthing person and partner alike to get those practice sessions in. Bonuses! There is so much bonus content in this course that I simply can’t compare it to any birth class I’ve ever seen, and more is still being added! With all of the information available on the Internet it sure is nice to have curated content from a trusted source at your fingertips. The feedback from couples who have taken the Evidence Based Birth®️ Childbirth Class has been outstanding. They report feeling a sense of accomplishment from having invested the time and effort in preparing for the arrival of their child. They also feel confident walking into the hospital for their birth. Couples who have taken this course benefited from an empowering birth experience and knew how to speak up to get the care that they wanted and deserved. I’m very excited to offer the brand new Evidence Based Birth®️ Childbirth Class for the first time starting January 20th and am offering $25 off any level registration. Just use code INAUGURAL25 to get the discount. Follow this link to register by January 13th. https://ebbchildbirthclassbrighton.eventbrite.com. To see classes available worldwide from other AMAZING Evidence Based Birth®️ Instructors, visit the calendar of events here. 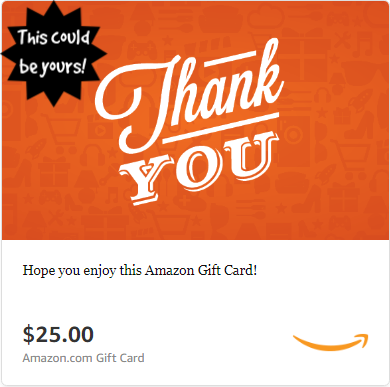 I am thrilled to offer the chance to win a $25 Amazon e-gift card to YOU when you refer a friend who registers for my upcoming Birth Prep Weekend workshop on October 27th & 28th in Brighton, MI. Just have your friend mention your name and email address when they register! Drawing will take place on October 28 and winner will be notified via email. During many of my childbirth preparation classes, one of the things we discuss is how and when to announce the birth. 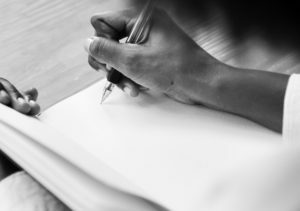 This was obviously not a huge concern before the advent of social media, but given how effortless it is now to share our thoughts, feelings, experiences, excitement and whatever we’d like without a second thought and with vast numbers of people simultaneously, we have begun discussing this as part of our postpartum preparation. I begin by asking my students if they have put any thought into how they plan to announce the child’s birth. Some of them say they will call the people closest to them, others say they haven’t really thought about it, and there is almost always one person who says, “If anyone announces it on Facebook before we do, I’m going to be really upset!” So, we talk about ways that we can bring this concern to our friends and family ahead of time in an effort to circumvent the problem. Enter: the Social Media Etiquette discussion. I have suggested that expectant families create a graphic to post during their pregnancy so that friends and family understand the importance of announcing the birth in the manner that they choose. If you don’t see anything posted to this effect, play it safe! It’s always best to assume that the couple prefers to be the source of the announcement if you aren’t sure. 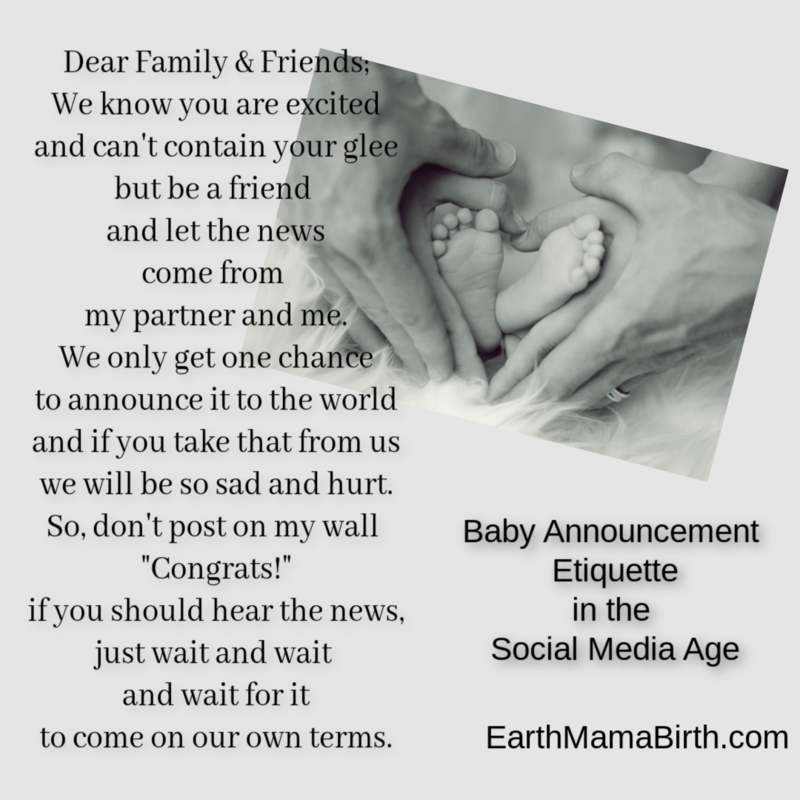 You may also be asked at the baby shower to refrain from posting anything about the birth until it is officially announced. If you spend a lot of time on social media or are a “Facebook Stalker,” You may find that the parents are all of a sudden very quiet on social media and think you have figured it out; but whatever you do, DON’T post “Congrats!” on their wall because other people can see that. (Pro Tip: This feature can be turned off in Settings.) Some couples might be okay with an email, message or text, but if they haven’t had the baby yet, and especially if the pregnancy has gone beyond the estimated due date, you run the risk of stressing them out. There are few things more annoying in late pregnancy than hearing, “Have you had the baby yet?” Stress is not good for mom and baby, so just . . . be . . . patient. The babymoon (the period of time after the baby is born and for several weeks afterwards) is a time when mothers and babies are adjusting to life as a dyad; it is both sublime and intensely difficult. Some of the kindest things you can do to show your support is to bring them a prepared meal (don’t stay too long! ), offer to do some cleaning or run errands and … save the big news for them to share. You probably have learned that people can sometimes STINK at being supportive of your birth intentions (and there are likely a million possible reasons for this.) You are probably more aware than others of the risks of receiving pain medications routinely during labor, and that’s why you are trying to avoid it. But, it gets exhausting trying to justify wanting a natural birth and frankly, you don’t really owe them an explanation. That’s why I’ve made this award; for YOU — the mom who just wants to shut down the naysayers. You do your thing, mama! Jenn D’Jamoos, CCCE is a mother of four and a certified childbirth educator based in southeast Michigan. She offers private and group birth preparation classes for parents who want a positive birth experience. Birth Preparation Methods and Why I don’t have a “method”. Now that I am a Certified Childbirth Educator, I can look back on my childbirth preparation experiences with a more critical eye. Let me first say, I don’t believe that there is one method that serves everyone, but rather, certain methods resonate with certain people. You like vanilla, I like chocolate . . . you get the idea. But how do you know what is a good fit for you? Let me explain. For my first baby, I took classes through the hospital, and I didn’t remember much of anything helpful by the time I was in labor. Those hospital classes did not teach me any coping skills. I was going to “try” to go natural (lol). I ended up getting pitocin and thought I had to stay confined to bed. None of the nurses there told me it would be easier for me to get up and move around. (Maybe they didn’t know because they only ever saw medicated births?) So, I didn’t. Culture had me believing that I was supposed to stay in the hospital bed, even though no one ever actually said that to me. Given that I was in tremendous pain, had no coping skills and my husband was equally at a loss to help me, I requested the epidural. 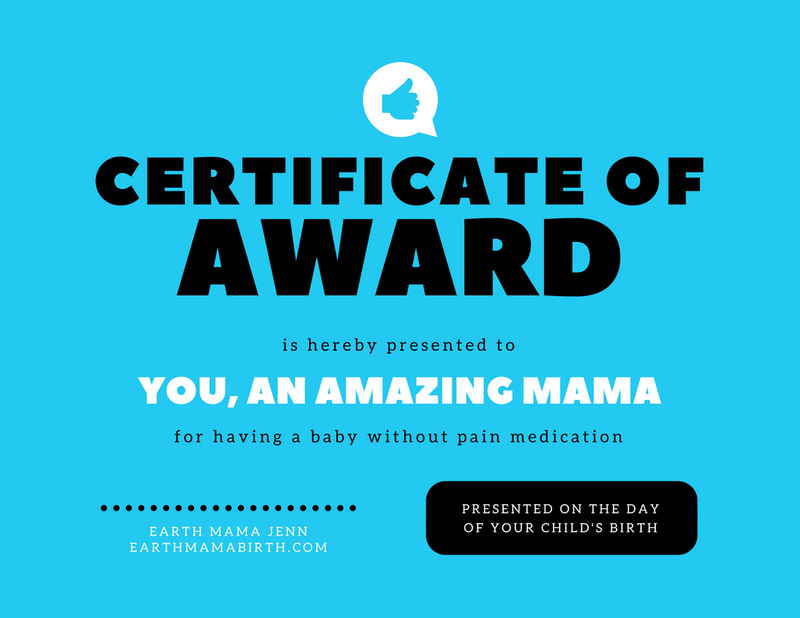 While the epidural was very effective in relieving my pain, I felt disconnected from my body and the birth experience. I was an observer; just another person in the room waiting for a baby to emerge. I knew if I was going to do this again, I’d need to seek out a different kind of class to have a better birth experience. 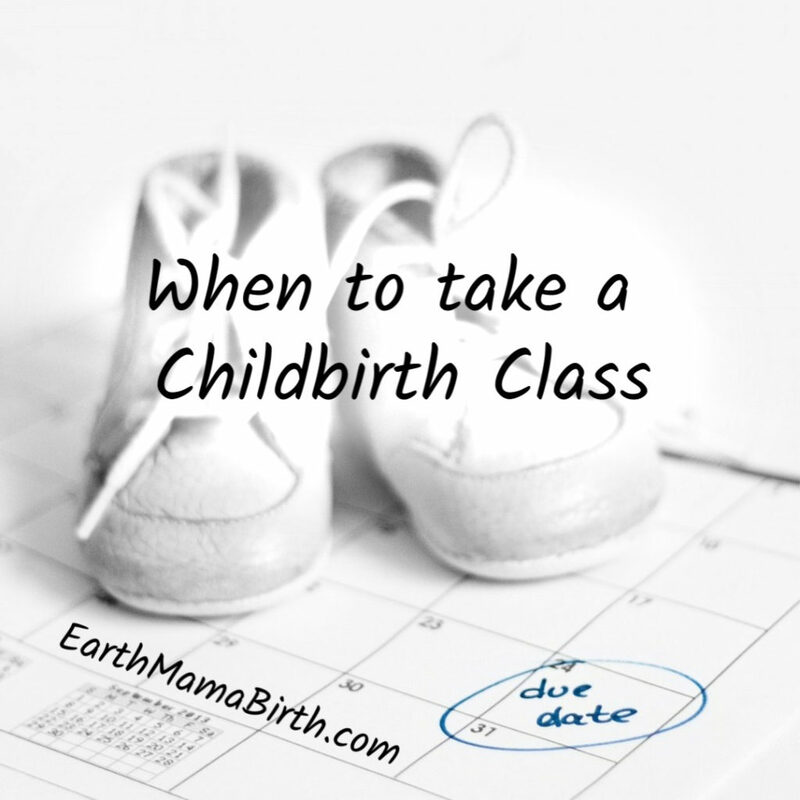 Fast forward to my second birth: we took a birth preparation class that was 12 weeks long. It was a popular method that celebrates husbands. We got a lot out of the class and I think it did a great job preparing us. But there were weeks we *really* didn’t want to go. I think if we were not already parents, we probably wouldn’t have taken that class. The things that drove me to do it were a.) a “night out” without our oldest, b.) 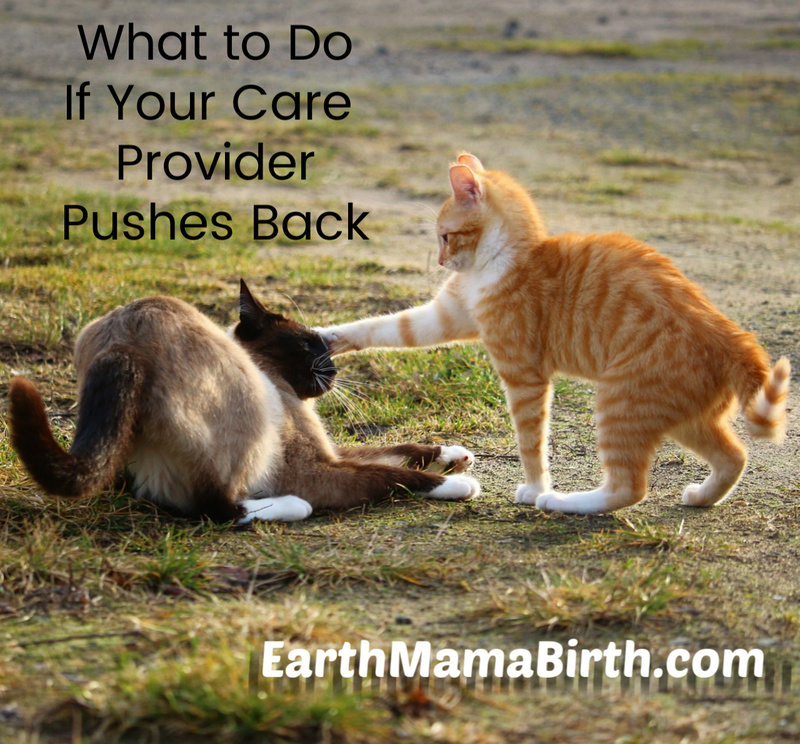 I really needed support from my instructor in navigating things with my care provider (another story for another time) and c.) I was determined to have a natural birth. Long story short, I coped with all of my labor at home and in the car. I don’t think my husband actually did any of the physical support he learned in that class. Most of what I did to get through labor in those three very intense hours was primal and instinctive. The main thing I got out of that class was that my body was made to do this. The class convinced me that I could give birth without interventions. (and I did!) I appreciated that my husband learned how to identify the different stages of labor by observing my behavior. He knew I was further along than I thought I was and thus, contacted our support people to come before I probably would have. I believe the classes were a good investment of our time and money. Third birth: To prepare for our first homebirth, I read a book on self-hypnosis for labor which was accompanied by a CD. (The book is also available in class format with instructor, which we did not take.) I was confident in my laboring skills after my second birth but I felt like maybe I just got lucky to have a 3 hour labor last time, so thought it wise to add some more tools to my toolbox. It was a little weird for me, to be honest. I didn’t get into it, even though I love “new-age hippie” stuff. Maybe self-hypnosis just didn’t resonate with me at the time, or maybe it was the scripts, or the voice on the CD. I could not “connect” with them. I also don’t believe calling contractions “surges” made them any less painful for me. So, did it help me during labor? What that book helped me do was understand that I had to be in a different part of my brain. I suppose I inherently knew this already because I made the effort to plan a homebirth; I couldn’t see myself laboring like I wanted in a hospital having had the previous experiences I had. I think the birth hypnosis book most helped me engage in the idea of seeing contractions in different ways; waves, colors, etc. to help cope with them and brought me to understand the value of birth affirmations. Fourth Birth: By the time I was pregnant with my youngest child, I had already been a Childbirth Educator for several years. I knew that all of my laboring instincts would kick in and that I could trust the process. I had another homebirth and added a doula this time for good measure. My doula was able step in and provide physical comfort/support while my husband took care of setting up the birth space and preparing supplies. It was SO NICE to have someone 100% dedicated to my physical and emotional needs while Chris managed other equally important aspects of the birth setting. The thing that stands out most to me, though, about coping with my fourth labor is that I had been able to turn inward and completely surrender to the will of my baby and my body. I didn’t have to use my thinking brain to remember things to do . . . it was instinctive. After reflecting on that birth, I came to the conclusion that the practice most closely associated with how I “turned inward” is known as meditation. A pregnant mother practices meditation to prepare for birth. I had never taken any classes in meditation until long after my fourth birth. But when I started meditating, I knew instantly that this place in my brain seemed familiar. It was just where I had been during the deepest, most divine part of my birth experiences. After researching, I understand now why practicing meditation is so profoundly useful for pain relief during labor. I believe that the efforts I made in preparing for birth during my pregnancies helped to get me where I needed to be for labor. These classes and books gave me tools I may not have had otherwise. Because I had experience with several approaches to childbirth preparation, I was able to make the informed decision to become certified by an organization (CAPPA) that doesn’t teach/promote/utilize a specific method, but rather draws from evidence based practices as well as the varied experiences and expertise of many mothers and birth professionals. Coupled with my training, I am able to draw upon my own experiences and knowledge to teach expectant couples a wide variety of tools to help them through their birth journeys. I firmly believe that a well prepared birth team has the best chances of having a beautiful and positive birth experience. Now that I am also an Evidence Based Birth® instructor, I am able to offer even more support in the way of preparing families for navigating birth in a medical setting. If you are deciding on a class that best suits you and your partner, there are many factors to consider including your schedules, your birth intentions and your birth philosophy. The vast majority of out-of-hospital group classes are going to be great for most couples, but there are sometimes limitations with scheduling and availability, so be sure to explore your options around your community and even a little further out from home. You might find a perfect fit just a little bit out of the way and it could make all the difference for you, your baby and your birth.